E-Agriculture is an emerging field focusing on the enhancement of agricultural and rural development through improved information and communication processes. More specifically, e-Agriculture involves the conceptualization, design, development, evaluation and application of innovative ways to use information and communication technologies (IT) in the rural domain, with a primary focus on agriculture. E-Agriculture is a relatively new term and we fully expect its scope to change and evolve as our understanding of the area grows. All stakeholders of agriculture industry need information and knowledge about these phases to manage them efficiently. Any system applied for getting information and knowledge for making decisions in any industry should deliver accurate, complete, concise information in time or on time. The information provided by the system must be in user-friendly form, easy to access, cost-effective and well protected from unauthorized accesses. Transfer information and knowledge rapidly over large distances through communications networks. Develop standardized algorithms to large quantities of information relatively rapidly. Achieve greater interactivity in communicating, evaluating, producing and sharing useful information and knowledge. The main focus of this article is to elaborate how the achievements of IT can be applied in Agriculture sector and its development. The office automation is application of computers, computer networks, telephone networks, and other office automation tool such as photocopy machines, scanners, printers, cleaning equipment, and electronic security systems to increase the productivity of organizations. There are many non-government organizations involved in agriculture sector and rural development. They all have to work together to give better service to farming community. Therefore, application of office automation is one of the solutions to enhance the efficiency and inter-connectivity of the employees work in all above-mentioned organizations. 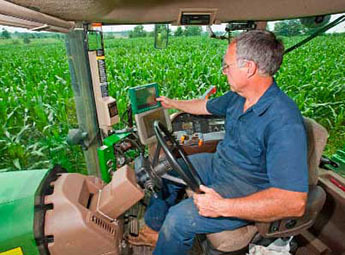 In agriculture, the use of the Global Positioning System provides benefits in geo-fencing, map-making and surveying. GPS receivers dropped in price over the years, making it more popular for civilian use. With the use of GPS, civilians can produce simple yet highly accurate digitized map without the help of a professional cartographer.